Tried being normal once. Worst two minutes of my life. 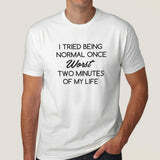 Funny attitude t-shirt. In case of any queries about our products and services, write us to hi@teez.in. Place a t-shirt that fits you on a flat surface and measure the chest as shown in the image in Inches & multiply it with 2 to get your size. Men's t-shirts are also considered UNISEX.